Seeking to reconcile the split between our inner child and our adult self, eminent philosopher and religious scholar Jacob Needleman evokes the ancient spiritual tradition of a deep dialogue between a guiding wisdom figure and a seeker. The elder offers an initiation to a younger self, an initiation the author feels is missing from our culture. Rendered as a stage play, the conversation between the 80-year-old author and his younger selves unfolds, and an ambiguity emerges as to whether this is strictly the author’s internal dialogue or whether the younger self may be nurturing a rebirth of the author. On one level, I Am Not I brings younger readers (teenagers and young adults) face to face with powerful spiritual and philosophical ideas. But as the book progresses, the dialogue delves into questions and insights that carry astonishing new hope and vision for every man and woman, challenging our culture’s accepted—and often toxic—ideas about humanity’s place in a living universe. In his most deeply personal work, Needleman cuts a clear path through today's clamorous debates over the existence of God, illuminating an entirely new way of approaching the question of how to understand a higher power. Needleman begins by taking us more than a half century into the past, to his own experience as a brilliant, promising, Ivy-league educated student of philosophy. Atheistic, existential, and unwilling to blindly accept childish religiosity. But an unsettling meeting with the venerated Zen teacher D. T. Suzuki, combined with the sudden need to accept a dreary position teaching the philosophy of religion, forced the young academician to look more closely at the religious ideas he had once thought dead. Within traditional religious texts the scholar discovered a core of esoteric and philosophical ideas, more mature and challenging than anything he had ever associated with Judaism, Christianity, and the religions of the East. This inaugural-and all new-Tarcher Cornerstone Edition presents a stunningly relevant and reliable translation of the thoughts and aphorisms of the Stoic philosopher and Roman emperor Marcus Aurelius, properly placing the philosopher-king's writings within the vein of the world's great religious and ethical traditions. The widely respected social philosopher embarks on his most gripping and broadly appealing work, asking the ultimate question of human nature: Why do we repeatedly violate our most deeply held values and beliefs? After nearly forty years of weighing humanity's deepest dilemmas-working in settings ranging from university and high school classrooms to corporate offices and hospitals-bestselling author, philosopher, and religious scholar Jacob Needleman presents the most urgent, deeply felt, and widely accessible work of his career. 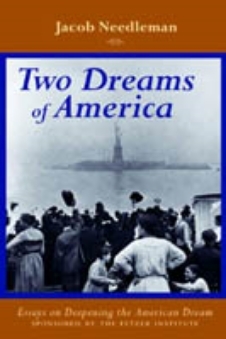 "...what of the American dream? Is it a vision or an illusion? Do we need to deepen this dream or awaken from it? Time is the greatest modern scarcity. What used to be considered signs of success--being busy, having many responsibilities, being involved in many projects or activities--are today being felt as afflictions. Needleman shows how to approach time with the aim to get more out of it by breaking free of our illusions about it. Needleman dispenses with tricks and techniques that only serve to make our obsessiveness more "efficient." Instead he shows how we can understand what our days are for. It's this understanding that allows time to finally begin to "breathe" in our lives. If we understood the true role of money in our lives we would not think simply in terms of spending it or saving it. Money exerts a deep emotional influence on who we are and what we tell ourselves we can never have. Our long unwillingness to understand the emotional and spiritual effects of money on us is at the heart of why we have come to know the price of everything, and the value of nothing. Our primary drive as humans, say the authors of this anthology of religious and philosophical writings, is not sexual or to do with any biological or socially conditioned impulse: It is hunger for meaning. "A good doctor is a good person." But today, Needleman argues, the physician has become the dispirited pawn of a "medical arms race" in which financial considerations are taking precedence over the welfare of patients. Cut off from great ideas and awakening experiences, doctors are either complacent or riddled with tension. Addressing them directly, the author mourns: "You are dying in your tracks, and you know it." In his personal account of his quest for 'the lost religion of love', Needleman explores the concepts of soul, prayer, meditation, and spirituality. He reconsiders ancient Christian writings, and demonstrates that a contemplative tradition existed in the early church, a tradition which continues today in the lives of certain extraordinary individuals. Western science has operated for centuries on the assumption that we can understand the universe without understanding ourselves. We are just now seeking to make the necessary connection between the general laws of nature the those of our own (inner) nature. But the job won't be done with "massive injections of the new consciousness"; we cannot democratize the sacred by cheapening its demands. This book describes the teachings and practices of the new, predominantly Eastern religions that are rapidly gaining influence in America. In remarkably lucid and informative terms, Jacob Needleman examines the specific areas in which traditional Western religions have failed modern man, and the ways in which the Eastern religions offer their followers the practical means for improving the quality of their lives. This book explores one of the most illusive, mysterious, and misunderstood spiritual traditions in the modern world. It is the tradition, or more accurately, family of traditions subsumed under the term "esoteric." The number of phenomena covered by the term is enormous, for it encompasses not only explicitly esoteric works and movements but also components to be found widely in art, music, literature, politics, and science. Adolescent Eliot Appleman joins the Sorcerers, a group of young magicians who share his yearnings and aspirations. As Eliot discovers he has genuine mystical powers, he is drawn into a perilous clash between two conflicting forces—the compulsion to manipulate others and the need to master his own nature and find his place in the world.